I’ve discovered having fun with my kids starts with me. Kids find enjoyment everywhere, from laughing at silly jokes (that probably have to do with farts or burps) to climbing anything in sight. Play and fun come natural to children. Sometimes this silliness—to be honest—is annoying. But it’s me, the adult, who has lost the ability to be childlike. Having fun with my kids starts with my attitude and ability to put aside my do-do list and enjoy the moment. And that can be hard to do! Connections and friendships usually grow from a shared interest. Friends who love to read, enjoy nature, appreciate good food, and love the arts are people I tend to have fun with. Of course, friendships grow deeper with time, but that’s where they often start. As a parent I often forget to connect with my children in the same ways I connect with my friends. I’m so busy providing for them and taking them to soccer practice I forget to relate to them as people. Sometimes, having fun with our kids means reconnecting over shared interests. Is there a sport you both love? An artistic endeavor you could both share? A series of books that capture both of your imaginations? Find ways to have fun by doing something you both are excited about! Nothing interrupts a good time like always being in a hurry. I don’t know about you, but that usually ends up with me barking orders at my kids like a drill sergeant. More often than not, in order to have fun I simply need time. And with such busy lives, time to simply enjoy our kids can be hard to come by. I’ve discovered I need to carve out space to just enjoy being with my kids, whether it’s an evening during the week or a few hours on a weekend. No agenda. No rush. One of my sons recently asked if he could go somewhere with me just by himself. So I surprised him by taking him to a snowball stand and we enjoyed an after-dinner treat, just the two of us. We spent about a half an hour and $4.00 together and he loved it. Now all the rest of my kids are excited for their night out alone with mom too! 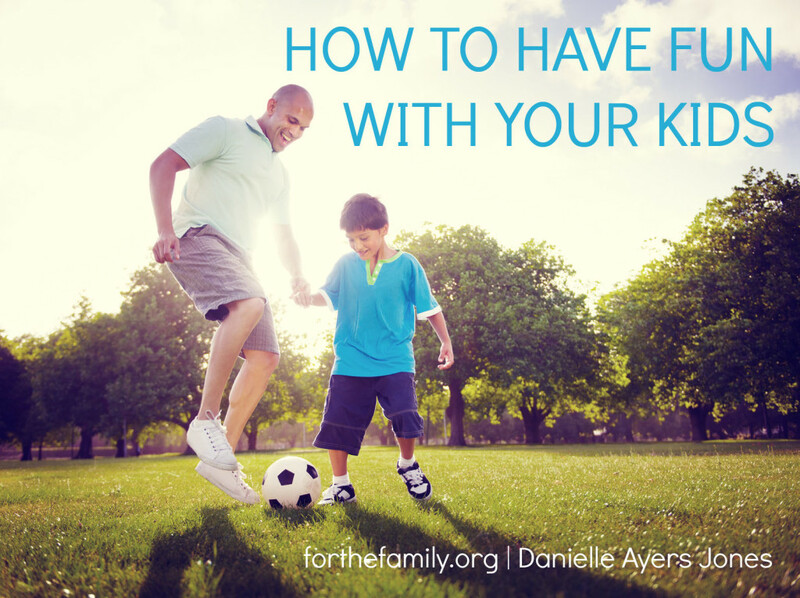 Having fun with your kids doesn’t have to be elaborate or expensive. Whatever your family loves, setting aside time for an unexpected surprise is sure to delight not only your kids, but you too. Do you have fun with your kids? Share how! My 5 yr. old daughter & I enjoy bowling & $1 movies in the summer. I love am spending time with her Thanks for sharing this article! We’ve done $1 summer movies too, Maggie. So fun. This is helpful for single mom like me.I realized that I spent little time with my only child due to office work. But it’s not yet late to find ways to bond with her, to get to know her deeper especially now that she is now a teenager. Thanks for sharing Elena. I’m glad you found it helpful and you’re right! It’s never to late to connect and bond with our kids, no matter the age!